Riflescopes in 3-9X variable power outsell all others combined, yet they are a compromise, ideal neither for long shots at distant targets nor moving shots up close. When a coyote looks my way at 300 yards, 9-times magnification just isn’t enough for these old eyes. And when one trots across at 30 yards, even the lowest 3-power setting doesn’t afford enough field of view to quickly pick it up in the scope. I am very much interested in the magnification at the high-end. But the widest field of view at the low end is equally if not more important. I carry my rifle with the scope set at the lowest magnification with the widest field of view, because that’s likely what I’ll want for a quick, close shot. There always seems to be enough time to crank the dial to high magnification as I bring the rifle to my shoulder for a distant shot, but there is never time (nor presence of mind) to crank the dial down when shouldering the rifle for a really close, really quick shot. Instead of dialing up through a range of magnifications, I’d be just as happy with a switch that instantly took the scope from the lowest to the highest setting, at least for coyotes. Variable riflescopes with a wider range than three-times have been around quite a while, and I’ve liked some of them. The old Weaver Company once offered the widest range; however, it was like peering down a narrow tube, and I didn’t care for that. A few years back, someone introduced a rifle scope which consisted of a video camera in front and a viewing screen in back. It had the potential for a phenomenally wide field of view, and I remember hoping it would be the future of riflescopes. But there must have been technical problems, because I don’t think anyone makes one today. I believe Swarovski was the first company to really nail six-time magnification, and they offer a variety of these scopes in different ranges, all with impressive field of view at the low setting. At close range, muzzle velocity is the key to ballistic performance. But beyond 250 yards, ballistic coefficient becomes more important, as seen where the heavier bullets with better ballistic coefficient fly flatter with less wind deflection farther downrange. They are extremely expensive, but if money is no obstacle, a coyote hunter probably couldn’t do better than a Swarovski Z6 30mm scope in 2.5-15X. They are offered with a 44mm or 56mm objective lens, with or without illumination. For dangerous game or anything else in the brush, the 1-6X has a phenomenal 127-foot field of view at the low setting. Leupold offers six-times magnification at a more manageable price, in 30mm scopes at 1-6X and 2-12X. The 2-12 power would be my pick for coyotes with enough magnification for long shots and a generous 57-foot field of view at the low setting. Burris, several years ago, was one of the first manufacturers to offer four-times magnification range as well as the first “made in America” six-time scope. I bought one, and it quickly became my go-to optic for both deer and coyote. But now I wish I had waited another year to order the same scope with an illuminated reticle. Field of view at 2-power is 50 feet. It’s available with either 40mm or 50mm objective lens. Bushnell boasts the widest variable power range, the Elite 6500 line with 6.4-times magnification. They offer a 1.25-8X, a 2.5-16X and a 4.5-30X. How you sight in that scope, the distance you pick for a zero, also makes a big difference. I’ve never bought into the idea of always sighting in to hit dead center at 100 yards, because sighting in to hit an inch or two high at 100 yards will put the zero farther downrange, and with a high-speed coyote round, you’ll have considerably less holdover for longer shots. “Point-blank range” refers to how far you can simply aim and take the shot without worrying about missing either high or low because of bullet drop. Basically, it comes down to the trajectory of the bullet and the size of the target. With high-speed varmint loads, trajectories tend to be flat, so point-bank range for coyotes can be surprisingly far. A fox, with a vital area about the size of a dollar bill, doesn’t allow as much margin for error as a coyote with its much larger kill zone. 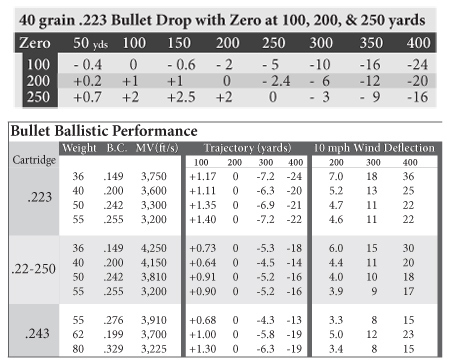 It is common knowledge that heavier bullets can perform better at longer range because of higher ballistic coefficients, and some claim they also perform better at close range because of increased impact energy. I’m not so sure about that when it comes to coyotes and certainly not fox. One must consider what is gained against what is lost, what matters most. I’ve had problems with heavy bullets in .223 and .22-250 leaving gaping exit holes. Yes, a heavier bullet may be deflected less by wind, and if I were shooting 400 yards or more, I would go with a heavier bullet with a higher ballistic coefficient. But here in the East, where wind isn’t as much of a problem and shots rarely surpass 300 yards, I handload 36-grain Barnes Grenade bullets. If I didn’t handload I would opt for the same bullet in .223 and .22-250 cartridges from Black Hills. The highly frangible bullet seldom passes through, so there is no exit hole, and with a screaming muzzle velocity of 4,250 feet a second, the scope can be zeroed at 200 yards and the bullet will hit only .73-inch high at 100 yards and 5 inches low at 300 yards. For longer shots, the 50-grain Grenade has a .242 B.C. compared to the 36-grainer’s .149 B.C. 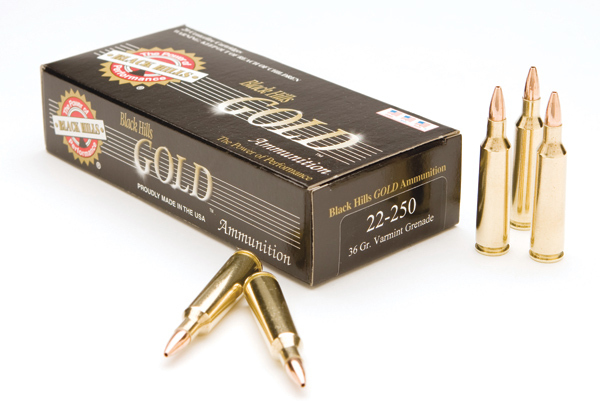 Black Hills also offers a 62-grain Grenade in .243.